Our AQUA CUTTER robots are tough and durable high-end products, built to operate over a long period of time. They are operated by an easily programmed automated control system, which ensures that the operator settings are used in an optimal way and that the movements of the jet are accurate and precise. In other words – an AQUA CUTTER is totally autonomous, a tracked machine which you program to perform the most advanced operations. The AQUA CUTTER evolution 2.0 control system features highly computerized robotic management for all advanced operations. The evolution control system enables you to program the most advanced operations. By combining a very sophisticated control system with our patented EDS lance control we have been able to develop a robot with very high efficiency and flexibility. Today, it’s the most sophisticated and flexible system on the market for Hydrodemolition robots. Read more about our Evolution 2.0 control system. Our Aqua Cutter robots comes in five different versions. All specially design to be able to meet all kinds of operations. They all feature many clever innovation and design aspects, such as our patented EDS system. 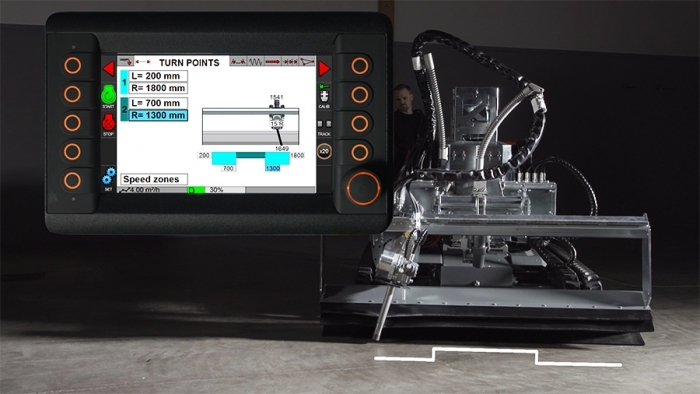 The system maintains the preset distance from the nozzle to the concrete surface throughout the whole operation, regardless of the attack angle of the water jet. The angle can be changed by as much as ±45º to ensure full-speed removal of the concrete between and under rebar. Our smallest Aqua Cutters, the 410 series, are perfect for applications within confined areas, where its small size and low weight allows it to easily pass through narrow passages or operate from scaffoldings. The Aqua Cutter 410A, with a hydraulic and articulated arm, can reach as far as 3 m (9,8 ft) and the Aqua Cutter 410V, with a steel mast constructed in sections, can reach all horizontal, vertical and overhead areas up to 4 meters (13,1 ft) without support. Read more about our Aqua Cutter robots. This is the bigger version of our Aqua Cutters and comes in three different models. The Aqua Cutter 710H has a smart design and is specially geared for efficient horizontal operations. Then there is the Aqua Cutter 710V, the most versatile robot on the Hydrodemolition market and suitable for all kinds of operations. With our innovative design it gives the operator freedom to reach all horizontal, vertical and overhead areas up to 7 meters (23 ft) without support. The Aqua Cutter 710V XL is the bigfoot version of the V-model. It features 200 mm/7.87 in wider and 170 mm/ 6.69 in longer tracks which means that it can handle more reaction force and has less weight per square meter. All of our products feature many innovative, unique and patented solutions. Our Aqua Cutters, with the Evolution 2.0 control system, features highly computerized robotic management for all advanced operations. It enables you to program, for example, geometrical figures such as circles, triangles, squares and rhomboids. Read more about all of our innovations and design features.